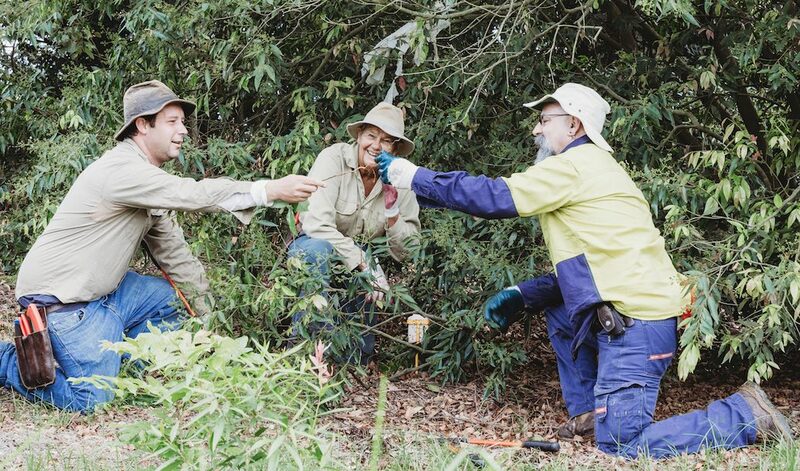 2019 sees Big Scrub Landcare (BSL) enter its 26th year of operation. We look ahead to a busy year as we undertake projects to the value of $1million over the next four years that promote, facilitate and undertake long term restoration and ongoing care of critically endangered lowland subtropical rainforests. Funding for these projects has come from the NSW Government’s SOS Conservation Co-Funding Program, other government grants, the Big Scrub Foundation and other philanthropic organisations. It will enable us to continue work on our Science Saving Rainforests Program, Remnant Care Program, Re-establishing Rainforest Program and Community Engagement Program. The initial phase of the Science Saving Rainforest Program has started, funded by the Big Scrub Foundation. This phase involves the collection of leaf samples for DNA sequencing from 3400 trees of 19 species across their range, which for some species extends from the Sydney basin to the wet tropics. This phase also involves finalising arrangements for securing the plantation site and planning site preparation. We will also be actively seeking funding of $400,000 for next stage of the program that involves DNA sequencing and genome analysis. If you haven’t heard about this project or you want to find out how you can help with the next phase click here. via Its project to convert Camphor Laurel forest to rainforest, also enhance connectivity across the Big Scrub landscape. facilitating community plantings, field days and other activities that contribute to the understanding and recovery of our critically endangered subtropical rainforest. BSL works with the following national, state and local government departments and agencies in delivering its programs: the NSW Government including its Saving our Species program and the NSW Environmental Trust; the Australian Department of the Environment, NSW National Parks and Wildlife Service, EnviTE Environment, Rous County Council, Ballina Shire Council and Lismore City Council. To find out more about BSL programs or how you can help email info@bigscrubrainforest.org.